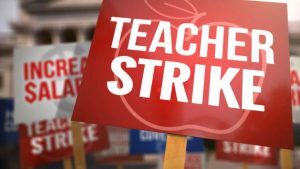 After a week of would they/wouldn’t they, Denver Public School teachers officially begin their strike today. Fortunately for working families, the district plans to keep schools open. Unfortunately for kids, that means that they’re being taught by subs who typically keep kids entertained by popping in a movie or some other non-essential activity that doesn’t actually lead to learning. “The Denver school district offered what Superintendent Susana Cordova called a significant proposal, just minutes before Saturday’s bargaining session was originally scheduled to end. “She said she had decided to eliminate performance bonuses for executive staff and cut even deeper into administrative expenses, eliminating 150 central office jobs. Teachers cheered the announcement, standing and clapping. While the union essentially called the proposal a distinction without a difference, the district accused the union of moving the goalposts. Regardless of who’s at fault, the real losers here are Denver’s kids. But, don’t worry, PeakNation™, it’s all for the kids, according to the union.